Clay Spinuzzi, "Tracing Genres through Organizations: A Sociocultural Approach to Information Design"
In Tracing Genres through Organizations, Clay Spinuzzi examines the everyday improvisations by workers who deal with designed information and shows how understanding this impromptu creation can improve information design. He argues that the traditional user-centered approach to design does not take into consideration the unofficial genres that spring up as workers write notes, jot down ideas, and read aloud from an officially designed text. These often ephemeral innovations in information design are vital components in a genre ecology (the complex of artifacts mediating a given activity). When these innovations are recognized for what they are, they can be traced and their evolution as solutions to recurrent design problems can be studied. 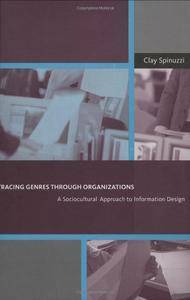 Spinuzzi proposes a sociocultural method for studying these improvised innovations that draws on genre theory (which provides the unit of analysis, the genre) and activity theory (which provides a theory of mediation and a way to study the different levels of activity in an organization). After defining terms and describing the method of genre tracing, the book shows the methodology at work in four interrelated studies of traffic workers in Iowa and their use of a database of traffic accidents. These workers developed an ingenious array of ad hoc innovations to make the database better serve their needs. Spinuzzi argues that these inspired improvisations by workers can tell us a great deal about how designed information fails or succeeds in meeting workers' needs. He concludes by considering how the insights reached in studying genre innovation can guide information design itself.